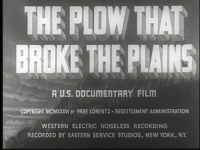 What better place to start than with the U.S Government produced film The Plow that Broke the Plains. It was made in 1936 and became controversial because it tells the story of the how the grasslands became vulnerable to destruction because of the actions of cattlemen, homesteaders, and farmers. The film seems to argue that the Great Plains are not meant to be farmed, and that the dust bowl was caused by the plow overturning the soil as well as the great drought that preceded it. All of that is essentially true, of course, but it seems strange to hear it from a government sponsored film. After all, the Homestead Act was a government program, and only a few decades before this film was produced, the government was singing a very different tune. During the late 1800s, the government was one of the biggest cheerleaders for westward expansion and Manifest Destiny. “Rain will follow the plow” was the slogan of the day that brought hopeful homesteaders west. This entry was posted in Uncategorized and tagged films of the great plains, homestead act, manifest destiny, rain will follow the plow, the plow that broke the plains. Bookmark the permalink.